Okay, in my continuing quest to learn about the broad ES family, I am curious what those of you who own or have played them think of the ES-333. Given that some of these are still available new through a few dealers (although Gibson ceased production in 2005, right? ), they seem like a great value in the ES family. On the plus side, the access panel on the back seems like a great option (although I can imagine that it might weaken the resonance of the body). On the down side, the lack of a hardshell case and the stock pickups (490R and 498T) seem odd choices to me for a semi-hollow. I can't imagine carrying a semi-hollow guitar around in a gigbag! Did these evolve into the satin finish ES-335 currently available, or are these a different guitar in terms of sound and feel? And would you recommend that a prospective ES-335 purchaser find one to try out? Thanks in advance for your thoughts. As the previous poster indicated, the ES 333 is a little more aggressive sounding than an ES 335 with '57 Classics. But, seeing as an ES 333 can be had for something like a third of the price of a new ES 335, you can change the pick ups, add a pick guard, buy a hard case, and end up with all the 335 essentials at a very reasonable price. The access cover in the back makes swapping pick ups relatively easy, too. Since we're on the topic of that access cover, I doubt that its addition does much to change the sonic characteristics of a semi hollow too much, given the ES series' shallow depth, multi-layer laminated top, and solid inner block. It does seem like the ES 333 morphed into the Satin finish 335, to fill the niche for a more affordable Gibson semi hollow. The satin finish ES 335 has the '57 classics and pick guard, and unbound frets. The ES 333 has a bound neck and frets, like today's gloss-finished ES 335s. I haven't looked at one in a while, but I THINK the fret profile on the satin finish ES 335 has may be narrower and lower, too. I have a natural 335 with a flamed top, a (red) 333, and an Epiphone Elitist ES 335 with a natural plain top, all made in 2004/5. They are each terrific instruments, with the Gibson 335 having a slight edge, as it's sweetest of the three. While each is very similar in neck profile, each has a slightly different feel, given their gloss/satin/poly finishes and fret profiles (the Elitist's frets are narrower and lower). While a lot of people knock it, there's a lot to be said for the ES 333's satin finish. It really feels broken in to my hand. I also have an Epiphone Revolution Casino with a similar finish, and it's a joy to play. It's good to see some chat here in the Semi-hollow forum. Let's keep it up! Thanks for the responses. As Red said, it is great to see some discussion going on in the hollow and semi-hollow forum. It is part of the reason I posed the question in the first place: to learn about Gibsons, yes, but also to get some regular discussion rolling around here. But back to the ES-333: it sounds like the ES-333 was a great deal, but these days, the prices on gbase.com seem to suggest that the easy upgrade to a near-335 is getting hard. A couple places there are advertising NOS ES-333s for $1450-1600, and the used ones in "mint" or even "excellent" condition are now listed only as "call or email for price." Major bummer. Replacing the pickups and adding a pickguard and a good case easily add $300-400 or more, and suddenly, the price for a 333 is the exact same or more than that for a brand-new satin finish 335. The 333 is even getting pricey on ebay these days. That isn't to say it might not be worth it. I do like the idea of the bound neck, frets, and wider neck that are part of the 333 package. I only wish I could get my hands on one to try out. I have tried out a satin 335, and it was great. I have a Larrivee OM-03, and, yeah, I too like the satin finish. That sense of feeling broken in and already an old friend is great to feel in a guitar, and I even like the looks of the satin finish better as well. I am going to hold out that I might track down a 333 in a local shop or perhaps at the Chicago area guitar show in the spring at the DuPage Expo Center. Oh, and by the way, my other guitar is a '50s-era full-depth ES-125. It was already banged up when I got it, but boy, it is a great guitar. I had some maintenance done to it over the summer to repair some of the problems the last few owners had created through neglect. Maybe soon, I'll post another thread to talk about that great guitar. Still, nothing can beat the tone of a 335, can it? I got mine new for $800. I've seen many sold in the $800 to $1000 range, so that's where I was coming from when I wrote that swapping PUPs, and buying a case and pickguard were an attractive alternative to a new 335. I had seen a few 333s on eBay in the $1200-$1400 range, but I didn't know this was becoming a universally accepted price. In that light, the satin 335 (which you get for around $1800 - $2K) looks like a better deal if you want/need the '57 Classics, etc. The fact that 333s are currently selling for MORE than an Elitist 335 makes the Epiphone look like an even better alternative, too. Believe me, it's about 98% of the Gibby. Still the 333 has charms of its own. It all basically comes down to preference (and opportunity to try and buy). We'd love to hear about your vintage axe. Start a new thread. We need some more topics on this forum! Hi Ignatious, I'm Ron and new at computer use so bare with me. I'm interested in finding out the value on some old Gibson guitars I've been playing for about fourty years, and don't know how to go about it. I thought maybe some one on this site may be able to help. I have an old ES-335TD ,Mahogany color,all original and in excellent condition. She still plays like a dream and screams incredibly.How do I go about my quest? First off, a great effort there! You are making great progress if you are a new computer user and already posting in online forums. Welcome to the online Gibson world and to the wonders of the internet! I thank you for your confidence in my abilities, but your question is one I don't feel comfortable answering alone. I will do a bit of looking about for resources and get back to you. In the meantime, though, I also am going to repost your message in a different thread here so others with more expertise can help us all to get up to speed on a great topic that you are asking about. When you ask a new question in a forum like this, it often is helpful to post it with the "new topic" button at the top of the page, rather than with the "add reply" button. When you only add a reply to a current discussion, then people who aren't interested in the current discussion never see your topic. But a newly added topic often is seen by everybody visiting the Gibson forum for at least a little while. So take a look at the new thread in the "Hollow and Semi-Hollow Body Guitar" Folder that has your name and question on it. Take care, and thanks for joining in the discussion. I know getting the hang of a new machine like a computer or a computer forum can be hard-going, but I think people here will do their best to give you a hand. We want Gibson users to hang around and keep talking! Wow, you guys are making a great case for the ES-333! I am thinking now that I definitely should wait for the upcoming Chicago area guitar show and go with cash in hand. Maybe I can find a 333 at a price that will make it worth it. In any case, it is great to hear that you are using the guitar as a regular player. I may just have stumbled on a very good, very available, and free hard-shell case that would fit an ES-335 perfectly so I think it would fit the ES-333 just fine. That already saves me a bit of potential upgrade cost. I have seen the prices that I have been mentioning on gbase.com, which is an online database of many different American dealers' inventories in one searchable place. I suppose I could see if the prices the dealers are quoting there are firm, or perhaps others know if gbase tends to attract overly high prices for posting? I don't know, and it is a sample of only five or six ES-333s that I have seen there so maybe I shouldn't assume prices have moved as much over the last few years as they appear to have moved at gbase.com. On the other hand, the ebay ES-333s do seem to be getting stuck now up in the $1100-1300 range as well. I'm not saying the guitar isn't worth that; I just hate to stick so much money into an ebay guitar because there rarely is a no-strings approval period as there usually is with a reputable online dealer or through a solid online community like the Martin forum or the Telecaster Discussion pages. And there remains that problem of getting the fantastic Classic '57 pickups into the guitar. I bought my Gibson ES-333 while they were still brand new...my ES is a 2002. Back then,I was looking for an ES-335 and found the 333...I tried them out,side by side,both through the same amp and I honestly like the 333 better.Maybe it's was something with the satin finish,but the tone seemed to resonate better. (but that's just my opinion). The only mods that I have done is that I have installed the nickel pickup covers and swapped out the tuners for new Schallers,which are vintage style,complete,down to the greenish tulip style buttons. The original Gibson tuners worked well for years,however,the 3rd/G-string tuner gear started to slip out of tune,so I upgraded to the Schallers.It still basically appears the same from the front of the headstock and Schaller even replicated the back side pretty good,as well...the only difference is that it reads "S DELUXE" instead of "Gibson DELUXE"...AS far as those who are interested in adding the pickup covers...you have to make sure that you purchase the newer modern Gibson pickup covers,Because of the pickup pole spacing at the bridge pickup. (which is slightly wider than the older styles or the 57 classics).I have also heard that the nickel is a better option than the chrome(which is due to the charcteristics of the metal and its tendency to sound better "tonally").other than that,the guitar has been kept relatively stock.I have played a whole lotta gigs with it and I really have had no complaints in the years that I have had it. you might take a little time to set it up (meaning,the bridge,the neck and the pickup height)...but that usually goes the same with any guitar. Furthermore,the Rear access panel is a blessing and a relief to any one who would ever have to make a mod or repair. I have had to rewire a few semi-hollow body guitars and I can honestly say that working on the standard ES guitars is a repairmans nightmare.The rear panel on the ES-333 will save you not only minutes but HOURS!!! The pickups(490R/498T)do have a bit edgier and bigger bite than the 57 classics and the 57 classic plus. but you can always back of the volume a tiny bit. I have a Gibson Les Paul Custom that has the 57 classics so I do think the 57's have a bit smoother tone.But with the ES you have better access to the higher frets. As for the satin finish...some prefer the satin looks and others prefer a glossy shine...if you prefer a shine...get a polish cloth and start buffing.I polish mine evry year,while watching the World Series and by the time the Series is over...you can see a good reflection...of course it doesn't have the "depth" of the clear gloss coats but you'll get a good glossy shine.and last but not least...(ACTUALLY,MOST IMPORTANTLY).... since they have a nitro-cellulose finish...you might put a piece of cloth on your guitar stand...some of the rubber on the stands(particularlly the Yellow rubber)tends to have a chemical reaction with the finish on the reverse side of the neck and will leave an undesireable blemish on your beloved investment...well good luck to all those searching for an ES-333...I LOVE mine! Well now we finally talk about the great ES-333. instantly taken by this guitar. It came with a case and was $800. owner who played mainly jazz and blues and that extremely well. South America, As he stated it blew quite a few 335s out of the water. is a joy to play. can sure keep up with them. My first post here (didn't even yet introduce myself), stumbled upon this forum while searching for info about the ES-333. I've been owning and playing my ES-333 for about two years now. It's my first Gibson and I love it dearly! Mine's the brown/walnut finish, made in 2004. I bought it used for €1,100 including a brown Gibson case (I live in the Netherlands. For comparison, a used 'standard' ES-335 from the same period goes for around euro 2,000 overhere, a new satin plaintop goes for euro 1,699; a DOT reissue for euro 2,099). A previous owner already installed a pair of '57 Classics and buffed out the satin finish to a nice shine and added a pickguard (that didn't quite have the right shape). I added a correct pickguard and replaced the knobs with witch-hat knobs (to give it a late 60ies look with the walnut finish). So except for the simple decal-logo on the headstock it just looks like an ES-335 (and sounds like one too I suppose). I have played only a couple of ES-335s in my life and I bought this 333 second (or third?) hand so I don't realy know how it compares to a 335, but when I tested it, it sounded lovely and just felt right in my hands so I took it. I've owned a Epiphone Sheraton II since '94 but this ES-333 certainly overshadows the Sheraton. My ES-333 is a very resonant and lively sounding guitar. It reacts very well to the volume and tone-controls. Not a bad tone comes out of it. Playability it better then any other guitar I own. I play mainly jazz and jazz-related stuff (nu-jazz, souljazz, funk) and to me the guitar is perfect for that. It's maybe somewhat darker and sweeter sounding that the average 335? But to me that's a good thing (the .012 flatwounds I put on might have something to do with that). I love this guitar and the relatively low price of it made me enter the Gibson-realm. It's a nice workhorse, sturdy and cheap enought to carry around in a gigbag (a good one though) to jamsessions and pub-gigs. And it's classy enough to shine at the bigger stages I played it on (jazzfestivals, clubs, etc.). I have sold most of my Solid body collection over the last few years and have totally switched to Semi-Hollow Body guitars. I started with a 2007 ES-339 which was great because it was the bridge between my Les Pauls and the ES-line. I then picked up a Toaki ES-60 which is known as a poor mans ES-335. I liked it much better than the Sheraton I used to have and it felt great and plays great. However, the wood that they use leaves a lot to be desired. I then saw an ES-333 on eBay for $1,000.00 with the case and I pulled the trigger. Unfortunately, when it arrived, the headstock was cracked! I thought about asking for partial refund and then fixing it but, the owner was very quick to take it back, refund my money and open a case with UPS. I did feel that maybe the neck was cracked before it made it into the case? Hi everyone! First time poster here. I've been primarily a bassist for over 20 years, though also play guitar and have been doing more guitar playing in the various cover bands I've played with over the past few years. Anyway, I've been a Fender guy for years, and my '52 RI Fender Tele is my #1, but I've always lusted for a ES-335 but never had the finances to do so. 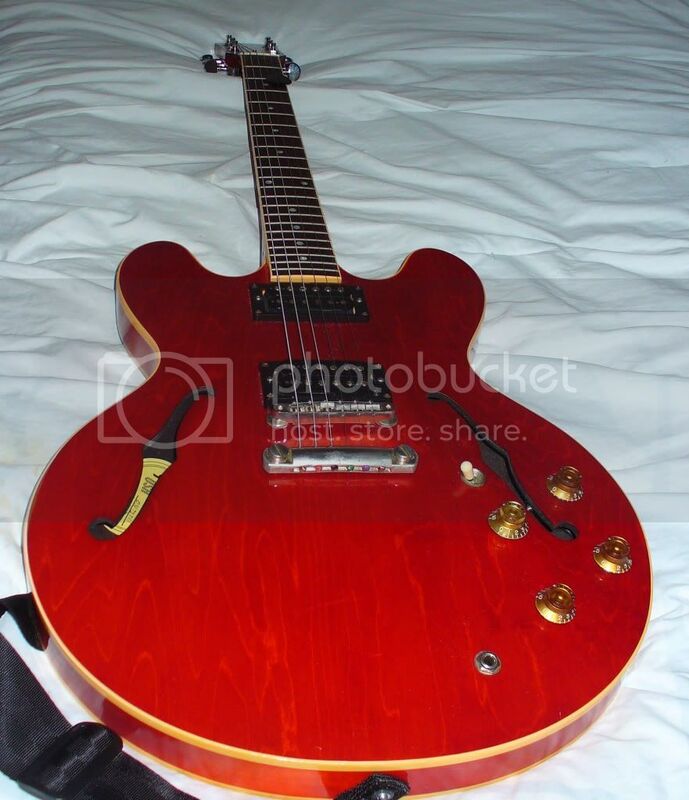 Well, I finally bought my first Gibson a month ago: a 2001 ES-333 LEFT HANDED model. (I've never seen another lefty, and since lefty ES-335's are still readily available i have to consider this ES-333 pretty rare comparatively to it's pricier brother). We lefties rarely have the opportunity to try guitars out before we purchase, since nobody ever has lefties in stock at local retailers (crappy Squire strat copies notwithstanding), so I ordered this sight unseen. All I can say is, Wow! What a fantastic guitar. Effortless, smooth neck and my mediocre finger picking technique has improved in leaps and bounds thanks to this guitar. I did swap out the PUPs for Gibson Classic 57 and Classic Plus PUPs, and my next "upgrade" will be to put on some bell top knobs and possibly buff the finish. I'm not going to put a pickguard on it though, since the guitar's so rare and I don't want to drill holes in it. Here is my 2002 ES-333. I bought it on Ebay and paid about $750 because it had a professionally repaired headstock. When I received the guitar, the first thing I did was to open the control cavity and I noticed a lot of solder. When I pulled out the pickups I found a Seymour Duncan 59 in the neck position and what appears to be the original pickup in the bridge. The guitar was also buffed out and had a nice shine. After many years of Les Pauls, the ES-333 and my 2007 ES-339 meet all of my recording and performing needs. I have a few ES3xx models including a 333, and initially after getting it I had mixed feelings on the 333. On the slightly negative side it did not "feel" like any of my Gibson 3xx gits, it's lighter, the neck is thinner and the frets are narrower, it just,"felt" different. It REALLY needed a pick guard for me to start to get comfortable using it because I often anchor my right hand on the PG. I also did not like the satin finish on back of the neck, and after buffing the back of the neck and adding the PG it went a long way to getting it to feel right. I also buffed the rear just to see what it looked like buffed out a bit... it's OK but I don't know if I'd go through the trouble of stripping everything off the top just to shine it up. The original pups are a good alternate voice away from the 57's, BB's, and patent number pups in my other Gibsons, it balances exactly like my others, a bit body heavy. I play all of my Gibson semis with a strap standing or sitting and that fixes that. As an added benefit of the 333, it has that access plate in the rear... I'm not a "modder" but one day I may fool around installing some of the many pickups I've acquired over the years in it. Overall, if I couldn't have a 335, 345, 347, or 355 I'd have a 333 any day and definitely over a 335 studio because I prefer white binding and I like the simple gold "Gibson" logo on the head. The 333's are real sleepers and a good buy compared to the 335 studio and (IMO) better looking. If I did not have a BB King I would want one of those for the simple fact it has a control cavity cover to access the pots and make it easy to mod or fix. I had a 335 but it was no match for BB, so like George Thorogood. sang, out the door it went. BB Kings have one due to no F holes unlike 335's. I know a solid back looks nice, but I'll take function over form any day. Yeah, for sure the BB Lucille is the bomb! I was always on the lookout for one and one day boom! There she was far away... click, click, click....type, type, OK, It's on the way! Gots me a red one. Took off the Lucille TRC and changed to blank black, changed the tortoise shell guard for black, changed the black chicken head to red, and put peace symbols on my knobs, and a poker chip. Nothing that can't got back to stock in about 10 mins. I started reading this thread from the beginning, and one of the first posters had the same ES guitars as I and thunk some of the same thoughts about them, and then I realized I wrote the post 10 years ago!